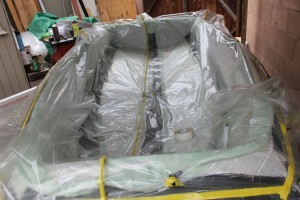 With the fibreglass and foam laid-up, we start preparing for the vacuum and infusion. 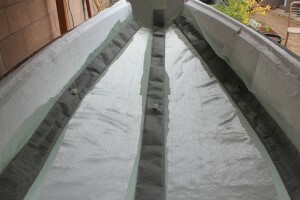 Below we attached channel medium to peel-ply to keep it from sticking to the top layer of fibreglass in the boat. Preparing the enka flow to be sure it doesn’t stick to the boat! Here the flow channels are in place. 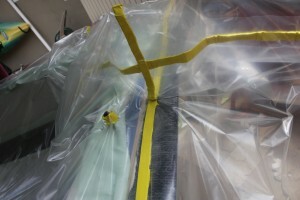 You can see small tears near the center, this is where the plastic T-fittings will be placed to attach the resin flow tubing. The T’s are in place in the channel flow. Also, you can see how much peel-ply was used. 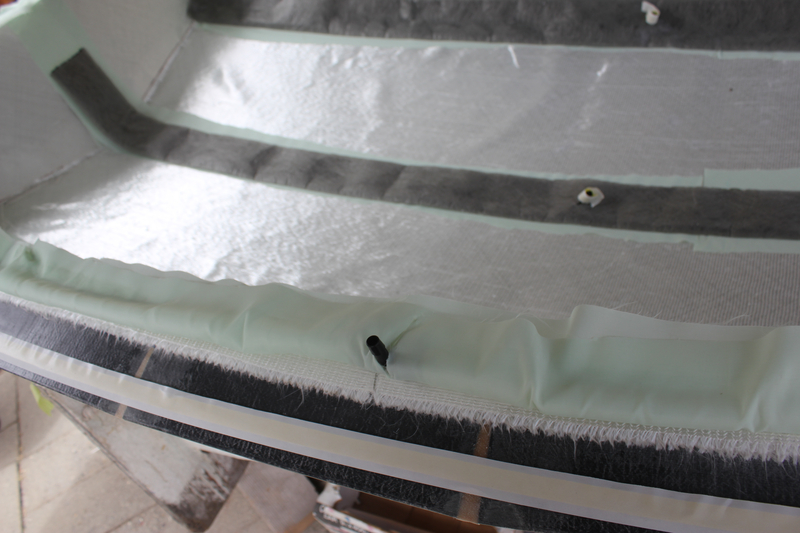 We could have put peel-ply all over the bottom (between the top fibreglass and the channel flow/vacuum bag but we’re trying to minimize on our disposable materials). Now the vacuum bag is laid over boat. The yellow material is bag tape to stick the bag to the mold flange as well as the seam down the middle of the bag. Also notice the T-fitting at the bottom of the image, it is attached to split tubing wrapped in peel-ply and this is where the vacuum tubing is attached. 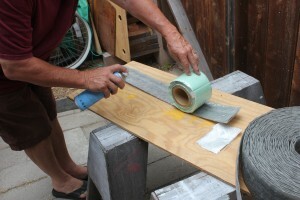 Also, to create a vacuum, the tape is used to create pleats. 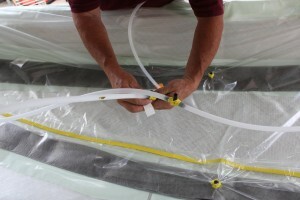 This is a common place to look for air leaks! Finally the vacuum tubing is installed and more bag tape is used to see all joints. Now when ready, we fire-up the vacuum pump. 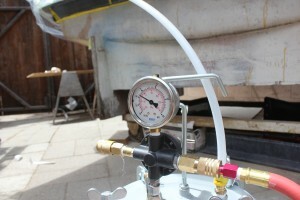 Below is the top of the vacuum tank with the vacuum gauge. 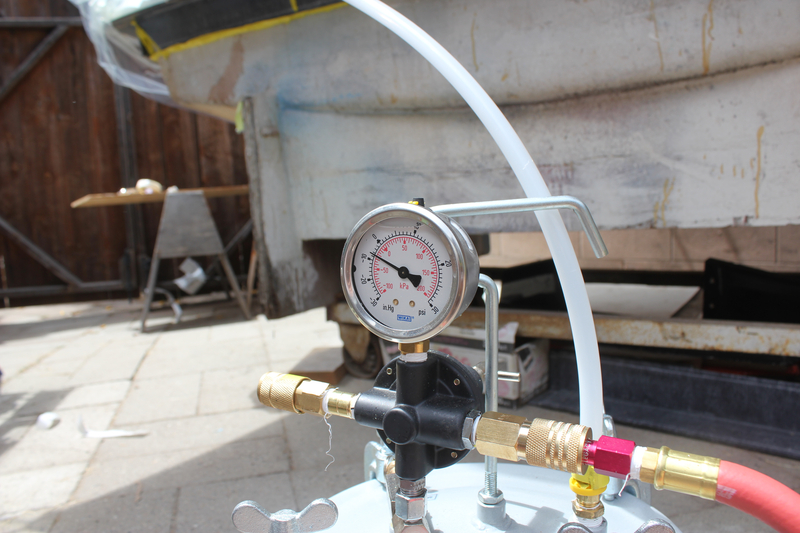 The tube running from the top is pulling air from the boat crating the vacuum. Also, any resin that is pulled out of the boat down the tube is trapped in the vacuum tank and not into the vacuum pump! Here you can see a short video clip of the resin being infused into the channel flow and out into the top layer of the fibreglass. You may notice the foam has thin grooves – this is used allow the fusion to easily flow over the foam.